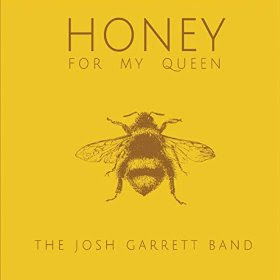 I just received the newest release, Honey For My Queen, from the Josh Garrett Band and it's deceptively hot! Opening with title track, Honey For My Queen, Garrett crafts a smooth southern pop track with a dash of country. Accompanied by Clay White on harp, and CR Gruver on keys, this track will make a solid radio track. Memphis has a laid back feel and continues with a rural easiness. Same Boat gets moving into a R&B slot and features James Johnson on guitar. With the fluidity and unpredictability of Mark Knopfler, intelligent guitar riffs flow nicely. Goodnight, Goodnight is a nice acoustic number with a blues flavor featuring Garrett on vocal and resonator and White on harp. Instrumental track, Slide in "G", starts the avalanche with it's driving beat and White's harping playing off of Garrett on slide and Gruver on keys. Easy Chair is a modern day "Help Me" blues with a nice groove and B3 cushion. Garrett really turns on the guitar heat on this track and it should make you sit back and pay attention. Whole Bottle Of Whine is another track built over a blues riff with a cool funky groove added over the top. Garrett explores another facet of guitar with a bit of chicken pickin and a few jazz riffs. Cool! My favorite track on the release, Ain't Nobody's Business, sets straight any thoughts about Garrett's blues chops. A nicely executed blues cover with excellent feel, this track is smokin! Dat's Alright With Me, is full out train style country rocker. Following the format of the Blues Is Alright or That's Alright Mama, this track takes full advantage of it's country rock roots with slick guitar riffs, Waylon Thibodeaux on fiddle and cool vocals. Wrapping the release is Moonshine and Cigarettes with it's new Orleans gait. Almost like a cakewalk delivering the happy spirits at the end of a long day, this track carries a summary of great music and instrumentals to the end. Very nice!